When specifying vessel and piping materials for handling and storing corrosive acids and bases, many lean on their educational training, personal experience and familiarity with products. If a carbon steel, stainless steel or fiberglass-reinforced plastic (FRP) vessel was specified for a similar situation in the past, the plant or operations manager is likely to choose it again, regardless of the expected service life. Relying on personal experience can be valuable, unless there is definitively a better option available. Considering alternatives and the reliability they have delivered in existing applications can help plants recognize greater performance, a longer service life and lower lifecycle costs. To accurately evaluate materials, key comparison factors must first be considered. Industrial-grade chlor-alkali production has been underway for more than 120 years, and in many ways, the principles by which these plants operate have not changed significantly. What has changed is the range of material choices available for chlor-alkali systems. Today, chlor-alkali plants operating across the globe require pipes, tanks, headers, manifolds, storage towers and more to be fabricated with resilient materials that can stand up to some of the harshest conditions existing in any industry. Lubrizol's Bryan Hutton to Speak at the Chlorine Institute Technology Symposium on March 15 Chemical manufacturing facilities have a tremendous burden of providing safe, economical and environmentally friendly operations. 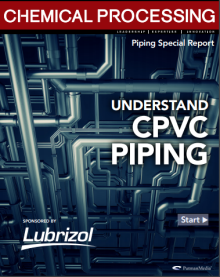 And while the plant engineering community has had extensive training with metallic systems, it’s had limited exposure to the capabilities and performance data of industrial thermoplastics, specifically CPVC. Insights from an industry leader By Bryan Hutton, Corzan® Industrial Piping Systems, part of The Lubrizol Corporation Chlor-alkali plants create some of the most corrosive environments imaginable. The transport of harsh chemicals at extreme temperatures in combination with the high voltage electrolysis process can quickly compromise the integrity of most piping systems. So when one of the largest producers of chlor-alkali products in the world needed a proven-effective solution for transporting and storing its hydrochloric acid, it turned to Thorpe Plant Services in Houston which turned to Corzan® Industrial Systems from The Lubrizol Corporation.